Those of you who follow me on Twitter might be aware that for the past few months I’ve been wallowing in PHP and CSS and WordPress code, and I’m happy to finally have something to show for it. Presenting the new and improved (?) 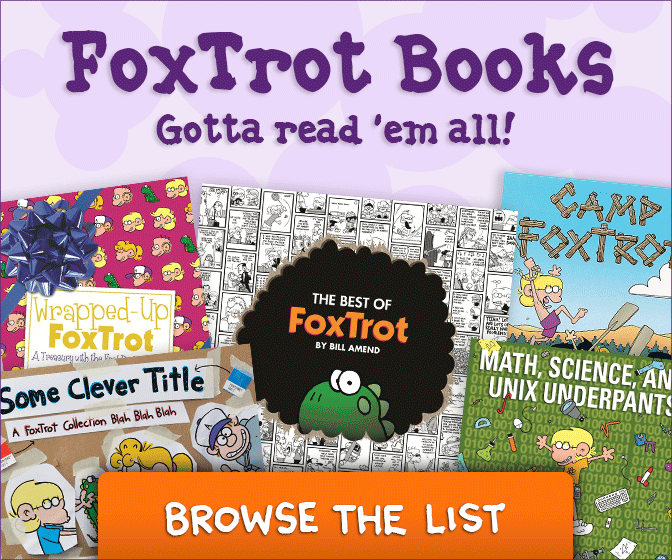 FoxTrot.com! I’d have to dig through my files to be sure, but I think this is the sixth version of the site since its launch in 1997, and my hope is you’ll find it the most comics-reading-friendly version yet. The biggest change is that I’ve switched to a layout that supplements the traditional next/prev comics navigation with a more visual grid design that I think will make browsing the archives and discovering strips you might have missed a little easier than in the past. I’ve also added tags to the comics, to aid in locating strips based on characters and subjects. We’re pretty happy with the new design on this end, and my hope is you’ll like it as well. Because the archives are being assembled by hand, they’re still a work in progress, so your patience is appreciated while I gradually build them up. Also, there are still a few site features/niceties on the drawing board that didn’t make it into this debut build but that I hope to figure out and implement over the coming months. I needed to get a working version of the site out the door before I went bonkers. Also keep in mind that because websites behave differently under the load of real traffic than they do in development on a local machine, performance may be iffy for a while until I get everything sorted out.